When creating an online account with Chainologie.com, you are agreeing to apply with truthful and factual information. Once created, you as the user are responsible for keeping your account information and password secret and for restricting access to the account via computers you use. You agree to accept responsibility for all activities that occur under your account or password. Chainologie.com is intended for people age 13 or greater. The United States requires online purchasers to be age 13 or greater. By creating an account or making a purchase, you are certifying that you are 13 years old or older. Chainologie.com shopping depends heavily on e-mail for communication: account signups, order confirmations, shipping confirmation, etc. After entering a valid e-mail address where Chainologie.com can communicate with you, please add e-mail address [email protected] and [email protected] to your list of approved e-mail addresses. Chainologie.com does not process spam control requests such as those provided by Earthlink. Chainologie.com provides product descriptions complete enough to describe the products for sale. We do not, however, warrant that our product descriptions or other descriptions on this site are totally accurate, complete, reliable, current, or error-free. Products may be described in either(or both) English units and Metric Units. Product size, product weight, product color, product finish, product composition and hole sizes are features, not defects. Applicability of the products to any specific design is not warranted. We reserve the right to correct mistakes in advertised pricing. If you feel a product is not as described, your sole remedy is to return it in unused condition, subject to Conditions and Return Policy, for store credit. Orders are sent as soon as possible, usually within 72 hours (excluding weekends and Holidays). Packages are sent FOB our business location. Your acceptance of the order is not dependent upon any specific design or project, schedule or event. Chainologie.com works with trusted manufacturers and accepts our manufacturers' assertions of lead-free, nickel-free and cadmium-free. Products are not independently tested. Site and Products are intended for adult jewelry. Any chain cutting should be performed with sharp chain-cutting pliers appropriate for the size and strength of the chain while wearing safety glasses with side shields or face shield. Cutting chain can cause small fragments of metal to fly in unexpected directions. Beads, caps, headpins, clasps, toggles and other small findings may present a choking hazard. Store and use chain, findings and tools in a manner to prevent accidental ingestion or other hazards to the body. Products are sold for assembly of jewelry only. Any other use of products is not warranted. Wearing jewelry properly -- Fine and fashion jewelry will degrade faster if worn when: Sleeping, Showering, Swimming, Sporting, Sweating and generally horsing around. Putting jewelry on properly -- Your jewelry will last longer using the simple rule "Last thing on, first thing off". Put on jewelry after clothes, cosmetics and perfumes; remove jewelry before taking off clothes, cosmetics and perfumes. Storing jewelry properly -- Your jewelry will last longer when stored in an anti-tarnish jewelry box or stored singly inside a zip-lock bag. Cleaning jewelry properly -- If you think that your jewelry needs cleaning, do some investigation before attempting to clean. Many cleaning dips will turn a sterling silver and silver plate yellow within a matter of days. Some cleaners are not recommended for plated products. Many times, using a soft, dry silver- or gold-polishing cloth will work best. Some environments are not good for long lasting, pretty jewelry. Places such as beauty salons, where bleaches, dyes and colorants are present in the air, swimming pools, the ocean, and similar environments will affect the appearance of your jewelry. Some people may have a skin chemistry that strips metal plates or causes rapid discoloration of the metals. Such causes are the responsibility of the Buyer or Buyer's clients, not Chainologie.com. Plated metals may vary between manufacturers and between plating lots due to complex environmental and chemical conditions. These color variations are considered normal and acceptable, not defects. While every effort is made to send a continuous piece of chain, splices in chains are considered normal and acceptable and not defects. Longer lengths are more likely to contain one or more splices. Your chain calculations should take into account the loss of cut links, the possibility of splices and the pattern of the chain. In the event that mistakes are made in posting prices, quantities and descriptions, Chainologie.com reserves the right to make corrections. Kindly note that, while we make every attempt to remain in stock of our products, the nature of international sourcing and geopolitics causes occasional shortages. We will ship partial orders unless you instruct us otherwise. If your item is out of stock, please re-order at a later date. Chainologie.com accepts Visa, MasterCard, American Express and Discover. Other forms of payment will be enabled in the future. All items purchased from OhioBeads.com are made subject to a shipment contract with goods FOB our shipping address. Our responsibility for delivering the goods is fulfilled upon our delivery to the carrier. All claims for damage or loss should be made immediately to the shipper. Please inform us at the same time so that we may assist with the processing of such a claim. Chainologie.com requires signature for deliveries of $250 or more. Customer will submit a delivery address that is accurate, safe and secure, especially if package delivery is expected when Customer is at work or out of town. Special delivery instructions besides the delivery address such as "Put on back porch if not at home" cannot be accommodated as delivery instructions. You may need to notify your local delivery agent for special delivery conditions. Proof of Delivery from USPS, Fedex, DHL, UPS and other carriers will establish sufficient proof that Chainoligie.com has fulfilled its obligation to deliver an order. First contact regarding an anticipated delivery, missed delivery or missing delivery should be made to the carrier providing the delivery service using tracking numbers provided at time of shipment. Sales Tax, Use Tax, Customs, Duties, Import/Export Fees, Value Added Tax (VAT), Environmental Packaging Fees, etc. At this time, Chainologie.com collects Sales Tax for delivery locations within the State of Ohio, USA, only. Any Sales Tax, Use Tax, Customs fees, Duties, Import/Export Fees, Value Added Tax (VAT), Environmental Packaging Fees or any other charges levied by or on behalf of a local, regional, national, transnational or international government remain the responsibility of the Customer until OhioBeads.com is compelled by Law to implement fee collection as a condition of sale. Chainologie.com offers Free Shipping in the United States with orders of $50 or more regularly priced merchandise via United States Postal Service (USPS) First Class Mail (up to 13 ounces) or USPS Parcel Post (over 13 ounces). OhioBeads.com may, at our discretion, send a package eligible for Free Shipping via Priority Mail. If your order is eligible for Free Shipping, you may still choose paid First Class shipping, USPS Priority Mail Shipping, Express Shipping or another offered delivery option at your discretion. Customer's intent for shipping is determined by the shipping selection made at checkout. For international orders and for domestic orders under US$50, Chainologie.com offers a variety of shipping options. Orders are sent as soon as possible, usually within 72 hours, often within 8 hours, subject to shipping days of Monday through Friday, 9 AM to 5PM, excluding Holidays. To comply with international shipping laws, we ship our packages marked with the Customs CN 22 form that declares the contents as merchandise with its appropriate value. This condition is mandatory; we will not "under-declare" goods. Any import taxes that Customs may charge you are out of our hands and are part of importing goods from another country. Once we ship the package, time delays due to U.S. Customs, destination Customs, carrier strikes, etc. are out of our hands and part of international business. If you know of additional paperwork requirements for package entry into your country, please include that information in a note at time of ordering. Chainologie.com will gladly accept the return of products that are defective in manufacturing and/or workmanship for 10 days from the date of purchase for store credit. We will gladly accept returns of incorrect products shipped as a fulfillment mistake for 10 days from the date of purchase in return for the correctly ordered product. In the case of incorrect products or defective products, shipping will be credited if it was paid. Shipping will not be credited for normal returns. Returns may affect the total price of your order due to quantity discounts or shipping specials. If you simply do not like the product you ordered, we will accept returns minus a 20% restocking fee within 20 days of your order. If the value of the returns causes the value of the order to drop below the threshhold for free or upgraded shipping, then the appropriate shipping fee will be deducted from any refund. Product size, weight, color, finish, composition and hole sizes are features, not defects in manufacturing or workmanship. 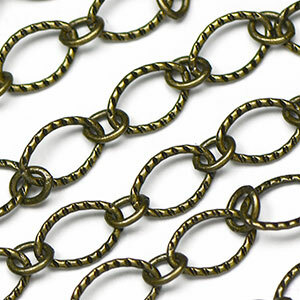 Chainologie.com does not accept returns on chain and wire products or sale merchandise. All returns must be accompanied with original packaging and with original sales receipt with a Return Material Authorization (RMA) Number and the reason for return written on the receipt. RMA Numbers are available via phone from your sales rep at 513.770.5564 or by email. Returns sent without a RMA on the label will be rejected. For your own protection, please send your return items in a rigid cardboard box or bubble-padded envelope. We recommend that you insure and track your package. Chainologie.com is not responsible for product returns that arrive to us damaged; we will not credit you for these items. Items returned in standard unpadded envelopes are often damaged by the postal service or carrier. Chainologie.com also cannot be responsible for items sent but never received. Any credits are issued after product is received and processed; date of processing may be later than the date of receipt at the RMA address above. Return Credits/Exchanges Credits will be issued after product is received (according to the instructions above) and is processed. If exchanges are desired, if not directly related to a fulfillment error, new shipping charges may apply. The United States Postal Service policy on lost packages mandates a waiting period of 30 days before issuing refunds. A Lost Package claim will require a signed form to be scanned and e-mailed or sent via mail to Chainologie.com' business address. A United States Postal Service Delivery Confirmation or delivery confirmation of another package delivery service will serve as proof that the package has been delivered and that Chainologie.com has fulfilled all responsibilities associated with product supply and delivery. Customer claims to the contrary are the responsibility of the customer with local Post Office officials or delivery service and appropriate law enforcement agencies that investigate theft. Refunds and credits may not be issued. Customer is responsible for accurately entering billing and mailing addresses at account setup. Packages "Returned to Sender" may be charged to customer if package was sent and delivered according to customer-entered mailing address. Terms and Conditions of Chainologie.com will overrule any counter-conditions which Buyer may submit through Purchase Order or other avenue. Buyer will indemnify, hold harmless and defend Chainologie.com, its owners, estate, heirs, assigns, etc. against Buyer (Buyer's owners, estate, heirs, assigns, etc. ), Buyer's Clients or Prospective Clients, for any allergic reactions experienced, for careless assembly or storage or for improper use of products and components. Maximum liability to Chainologie.com, its owners, estate, heirs, assigns, etc., is limited to the amount of the original product order less any discounts, coupon savings, or shipping charges outstanding. Any legal actions attempting to involve Chainologie.com, owners, estate, heirs, assigns, etc., will take place in Warren County, southeastern Ohio, USA, or in a jurisdiction of Chainologie's choosing.